Gov. Chris Sununu is urging Homeland Security Secretary Kirstjen Nielsen to raise the cap on H-2B nonimmigrant temporary worker visas. Sununu sent a letter Wednesday to Nielsen and Labor Secretary Alexander Acosta, expressing concern over the limited number of H-2B visas that are available. The limit “is having an adverse economic impact on New Hampshire and must be addressed,” wrote Sununu in his letter, pointing to New Hampshire’s tight labor market and 2.6 percent unemployment rate. The budget deal passed by Congress in March gives Nielsen the authority to raise the current H-2B visa cap of 66,000 to approximately 100,000 in consultation with the labor secretary. On March 1, U.S. Citizenship and Immigration Services announced that, in the first five business days of accepting H2B petitions, the agency received 2,700 requests for approximately 47,000 workers for the second half of the fiscal year – 14,000 more than the entire 33,000 H-2B visas currently allowed for the period. 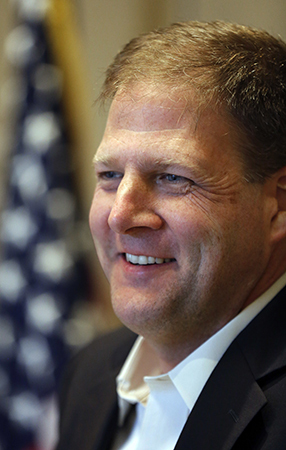 Historically, H-2B visas have been awarded on a “first-come, first-serve” basis, wrote Sununu. But the imposed cap has resulted in a random lottery system. The governor implied that one of the reasons he wrote the letter was a feeling among New Hampshire employers that their needs weren’t being heard. “Granite State companies have expressed their concerns with the changes to the H-2B visa program but nevertheless have felt their concerns for their employees and businesses have been ignored,” wrote Sununu.